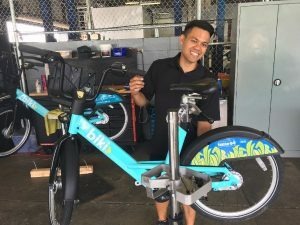 Ever wonder who keeps Biki Stops well maintained and stocked, answers all your customer service questions, and ensures that Biki bikes are set to ride each and every day? Here at Biki, we have an awesome team of local employees who are available 6 am – 11 pm 7 days a week (and 365 days a year!) working hard to ensure that our bikeshare program is ready for riders when they want to check out a Biki. We recently polled several members of our operations team and asked them to answer some fun questions in order to learn more about their jobs as well as to get to know them better. One thing that they have in common since joining Biki? They all Biki whenever they can! 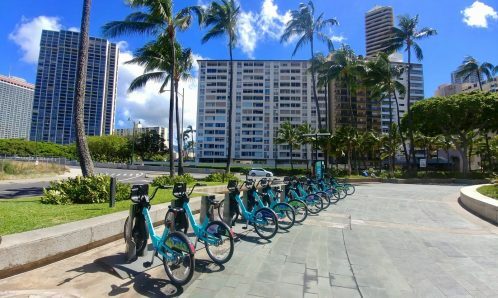 I am responsible for the all the operations of the Biki system, from maintenance, to cleanliness and making sure everyone has a bike or a dock available. Do you have a favorite interaction with a Biki user to share? I love all the stories I hear about people getting on bikes for the first time in many years, seeing people learning how to use bikes at the HBL workshops, and all the new adventures people are now able to do with Biki bikes available for them at any time. Did you ride or own a bike prior to joining the Biki team? Do you use Biki? Not for many years, but I now ride a Biki daily. My main role at Biki is to maintain and repair the bike share system. I also am responsible for testing and implementing system upgrades. Why were you interested in joining Biki? Living here in Hawaii, it is vital that we all take steps to ensure a sustainable future. 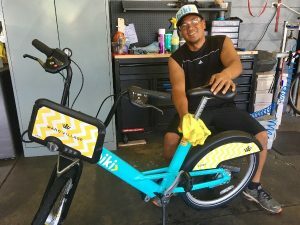 A bikeshare system provides a service that is fun and allows people to take part in this effort. Riding Biki reduces the amount of car traffic we have on our already overcrowded streets, and the carbon emissions that go along with that. One day out in the field an older gentleman approached me to let me know how much he loved the system. He told me that since he no longer drives, he only used to take short walks to nearby stores and the market. It’s probably been almost 40 years since he has been on a bike and he was reluctant to ever get on a bike again. His neighbor was using the system regularly and gave him the courage to try it. “It was like I never forgot,” he said. He started with short trips to the nearby market he was familiar with then slowly going further. In a matter of a month, he is going places that he wouldn’t have before. 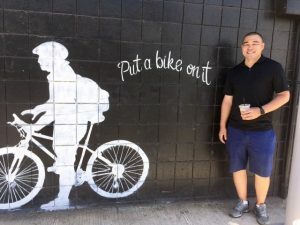 He now rides a Biki to meet friends every Thursday for breakfast. Absolutely! I don’t live in town but when I come in, I ride Biki. Everyone knows parking is hard in Honolulu especially during events. It takes the stress out of finding a place to park. I am in charge of all HR needs for the company, all of the office operations, policies and procedures, and the Call Center. 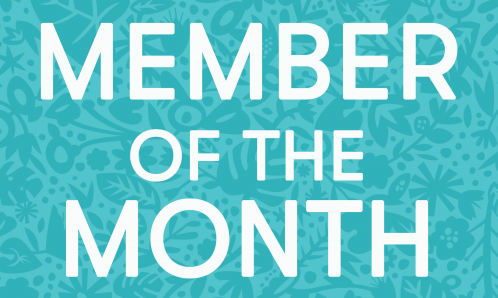 I really wanted to be involved with a company that contributes positively to the community. I wanted to have a job I can be proud of. At a recent Eat the Street event, I watched a Biki volunteer teach a new user how to ride a bike. The new rider was so excited to ride a bike for the first time! I do use Biki. I find it very enjoyable to bike, and it puts me in a good mood. 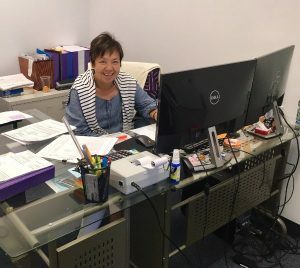 Overseeing the income and expenses for Biki. Fixing, maintaining and washing the Biki bikes. Did you ride or own a bike prior to joining the Biki team? Yes, I have my own personal bike that I commute with every day. I ride a Biki bike every Monday, Wednesday and Thursday. I’m responsible for ensuring that the bikes are clean, maintained, safe, and operating properly. 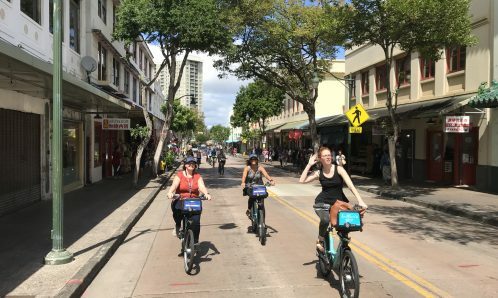 The concept of having more people riding bikes is really good for Oahu because it lessens the burden of traffic congestion in urban Honolulu, promotes a healthy lifestyle, and decreases the demand for fossil fuel. Whenever I’m in town I ride the Biki bikes. Anything else you wish to share about your job or experience with Biki? Ever since working for Biki, I get to explore more of downtown. I get to see all these businesses that I never knew existed and see all of the amazing art in Kakaako. Did you know that women account for only 34% of bikeshare users in the U.S.? Let’s change that! In honor of Women’s Bike Month, we will be giving our Biki women the chance to score some free rides. To enter, post photos of yourself on a biki with the hashtags #womenwhobike and #GoBikiHI by September 30. We will contact you if you’re a winner! September was a busy month for Biki as we joined forces with local organizations to promote health, the environment and bicycling. 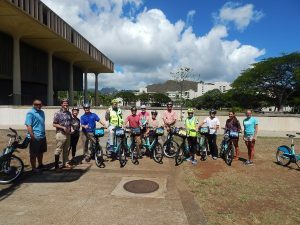 On September 19, Biki teamed up with Hawaii Bicycling League and Blue Zones Hawaii for a “Built Environment Tour” that started at the State Capitol and through town including the two cycle tracks. 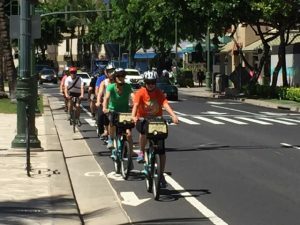 The goal of the ride was to highlight infrastructure needs to promote active communities and Complete Streets in Hawaii. 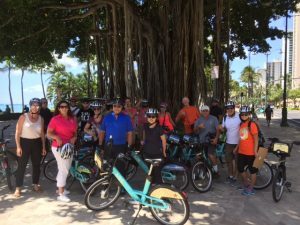 On September 20, Biki and Hawaii Bicycling League members participated in a four hour ride to kick off the Hawaii Congress of Planning Officials Conference. 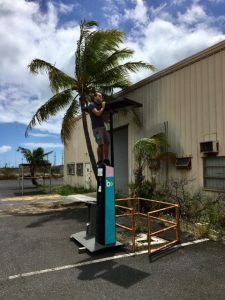 Bikeshare Hawaii in partnership with Toole Design Group and HHF Planners won an award for transportation planning! We were excited to participate in Blue Planet’s EV Parade on September 17 for Drive Electric Week. We drove our EV smart car with a Biki on the back. 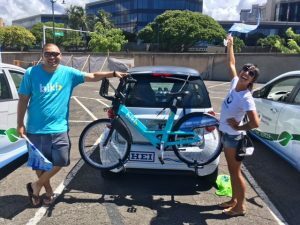 Three separate “parades” around town culminated at Kapiolani Community College for an EV party where community members’ EVs were showcased. It was an awesome way to bring together advocates and EV owners! We enjoyed chatting with everyone who stopped by our booth at Aloha Festival’s Waikiki Hoolaulea on September 23. 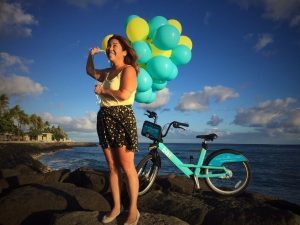 Want to support Bikeshare Hawaii and our vision of a more connected Hawaii? Consider Adopting a biki! 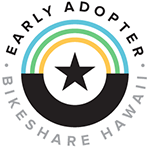 Our early adopter program lets you personalize a bike and track it’s progress in exchange for a donation to help support our non-profit mission.